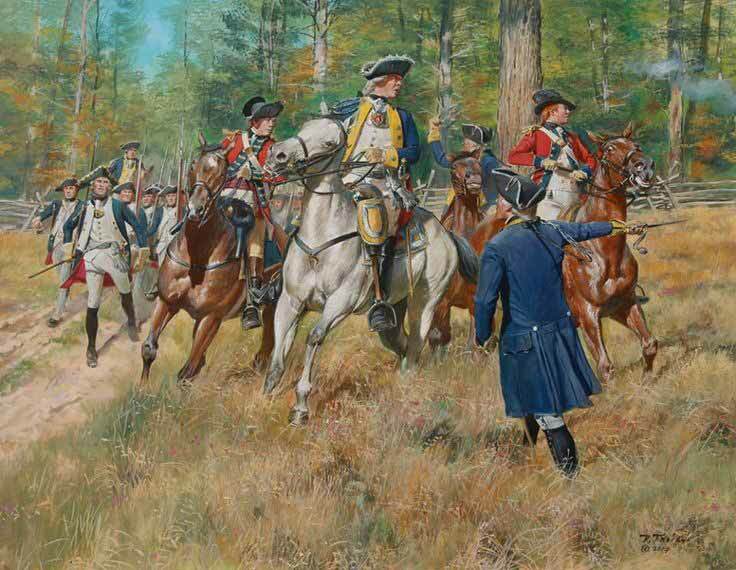 The Battle of Huck's Defeat was a significant turning point for the back country during the American Revolution. Early on the morning of July 12, a battle was fought near the home of Colonel William Bratton in York County, South Carolina, which was to have far-reaching consequences for the Patriot cause. 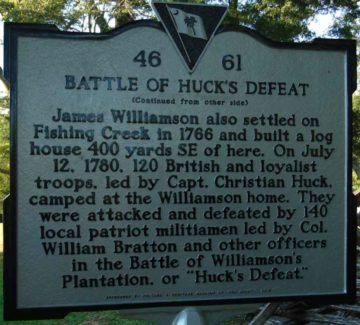 This engagement is known as the Battle of Williamson's Plantation or, more popularly, simply as "Huck's Defeat." Armies - American Forces was commanded by Col. William Bratton and consisted of about 250 Militia. British Forces was commanded by Capt. Christian Huck and consisted of about 115 Soldiers. Casualties - American casualties were estimated to be 1 killed and 1 wounded. British casualties were estimated to be 35 killed, 30 wounded, and 30 captured. In the spring and summer of 1780, the Revolutionary War moved full force to the area between the Broad and Catawba Rivers, now known as York and Chester Counties. After capturing Charleston in May, the British occupied Camden and established a strong post at Rocky Mount, a high elevation overlooking the area where Rocky Creek enters the Catawba. Rocky Mount was commanded by a British officer, Lieutenant Colonel George Turnbull, and was garrisoned by 150 men loyal to the British Crown, including elements of Turnbull’s own regiment, the New York Volunteers, and a troop of British Legion dragoons or light cavalry under Captain Christian Huck. Huck was a lawyer from Philadelphia of German ancestry and a staunch Loyalist, and he had a particular dislike for the Scotch-Irish Presbyterians in the South Carolina backcountry, most of whom were Whigs or “rebels,” as the British called them. In June, Turnbull dispatched Huck to destroy the Whig militia camps at Fishing Creek Church and Hill’s Iron Works, which Huck accomplished with great satisfaction. The Whigs moved to the east side of the Catawba River and began organizing a partisan militia brigade under the command of General Thomas Sumter. In early July, Turnbull received intelligence that many of the rebels, including Captain John McClure and Colonel William Bratton, had returned home to check on their wheat harvest and to enlist recruits for Sumter’s Brigade. Turnbull gave Huck instructions to apprehend McClure and Bratton and disperse the rebels in the upper Fishing Creek and Bethesda communities. On the evening of July 10, Huck set from Rocky Mount with 35 British Legion dragoons, 20 mounted New York Volunteers, and 50 mounted Tory militia. On July 11, Huck visited the home of John McClure. McClure had already left for Sumter’s camp, but Huck captured McClure’s younger brother and brother-in-law and sentenced them to be hanged the next day. He terrorized the boys’ mother, set fire to their home, and then departed for the plantation of William Bratton some ten miles to the north. Bratton and McClure soon learned that Huck was once again on the rampage, and they quickly made plans to intercept him. Believing that Huck was camped at Walker’s Mill in Chester County, they set off on July 11 in an effort to ambush the Loyalists. Other local Whig commanders, including Colonel Edward Lacey from Chester County and Colonel Andrew Neal from York County, also learned of Huck’s expedition, and began gathering men from all over the area to intercept Huck. Meanwhile, Huck’s force continued north into York County, headed for Bratton’s plantation. They arrived at the Bratton home late on the afternoon of July 11. The Tory militia was first on the scene, and one of them threatened William Bratton’s wife Martha with a reaping hook. Lieutenant John Adamson, a Loyalist officer from Camden, intervened and saved Martha’s life. Local tradition states that Martha sent a trusted African-American slave named Watt to find her husband and warn him of the British presence. Huck then arrived and interrogated Martha, trying unsuccessfully to persuade her to reveal her husband’s whereabouts. Martha refused to give him any information. After forcing her to prepare supper for him and his officers, Huck moved his troops to the neighboring home of James Williamson, who had a large field of oats that Huck needed for his horses. When the various Whig companies rendezvoused at Walker’s Mill, they found that Huck had moved on toward the Bratton plantation. Arriving at Bratton’s before dawn, the Whigs learned that Huck was camped at Williamson’s. 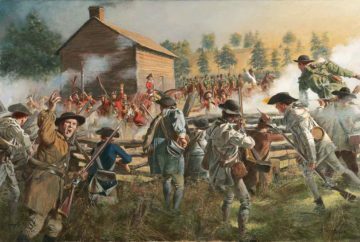 The Tory militia was positioned in an old field in front of Williamson’s house, while the New York Volunteers were camped in a fenced-in lane running from the main road down to Williamson’s homeplace. The Legion dragoons were arranged around the house, and Huck was asleep inside. The Whigs made plans to attack at daybreak and divided their forces into two companies. One group would attack the west end of the lane while the other attacked the east end, thus cutting off any chance for the Loyalists to escape to the main road. The Whigs took cover behind the fence and the trees and prepared to open fire as soon as they were spotted by Huck’s sentinels. Just as the sun began to rise, the Whigs commenced their attack, and the Loyalists were caught completely by surprise. The Legion dragoons and the New York Volunteers tried to counterattack but were frustrated by the fenceline and the trees, which the Whigs used as cover. Many of the Tory militia, seeing the road blocked by the Whigs, abandoned their horses and fled to the surrounding woods. Other Tories, seeing no chance to escape, grounded their arms and surrendered without a fight. Huck tried to rally his dragoons, but a militaman named John Carroll loaded two balls in his rifle, took aim and fired, killing the captain instantly. The battle was over in about ten minutes. The Whigs loaded up the Loyalist prisoners and sent them back to Rocky Mount later that day. 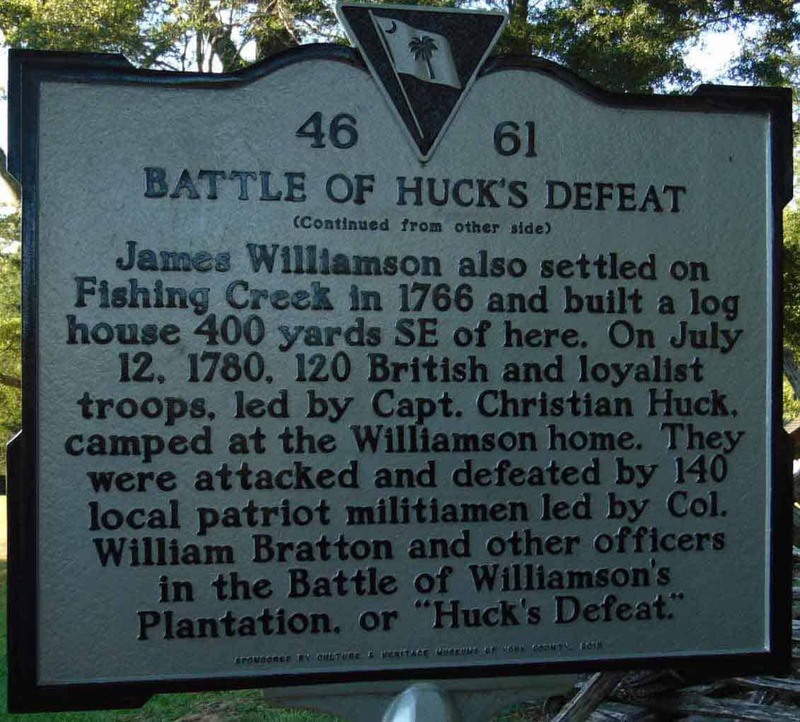 The destruction of Huck’s Loyalist force at Williamson’s Plantation helped revive the morale of the people in South Carolina just when British victory seemed inevitable. Although the numbers engaged were small, the importance of the skirmish was immediately clear. As South Carolina historian Walter Edgar has written, "The entire backcountry seemed to take heart. Frontier militia had defeated soldiers of the feared British Legion." Volunteers streamed in to join the partisan militia brigade of General Thomas Sumter. Edgar has called Huck's Defeat "a major turning point in the American Revolution in South Carolina." It was the first of more than 35 important battles in South Carolina in late 1780 and early 1781, all but five of which were partisan victories. The battle served as a rallying point for the backcountry Whigs, and set into motion a series of significant events which eventually led to the even larger Patriot victories at King’s Mountain in October 1780, Cowpens in January 1781, and finally to the British surrender at Yorktown in October 1781.